James Dapogny passed away in Ann Arbor on March 6, 78 years old. Cremation has taken place and there will be no funeral. 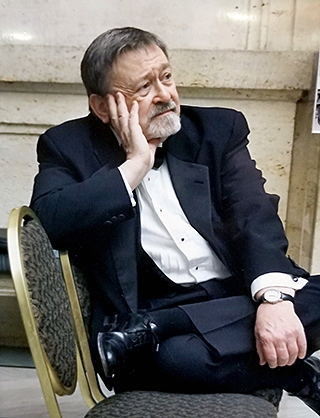 A jam-packed “Mini-Jazz Holiday” was held in his honor at the Zal Gaz Grotto Club in Ann Arbor on March 24 and a larger memorial gathering will be announced at a later date. His widow Gail spoke very coherently at the memorial about how the two met as graduate students in the School of Music at University of Illinois. Dapogny’s passing merited an obit in the New York Times, an indication of his renown. He was a much praised pianist, bandleader, composer, arranger, and music scholar, but remained a very modest man with a great sense of humor as Gail and many others have pointed out. Dapogny was born in Berwyn, Illinois, and grew up in Downers Grove. He received his academic degrees (up to Ph.D.) at the University of Illinois, and joined the University of Michigan faculty while completing his doctorate in 1966. He was a prolific scholar who published in many academic journals. He is probably best known for Ferdinand “Jelly Roll” Morton: The Collected Piano Music published in 1982. This was a ﬁrst-of-its-kind collected edition of a jazz musician’s work and the world’s ﬁrst jazz critical edition, prepared in cooperation with the Smithsonian Institution. He also oversaw a compilation of Morton’s recordings from the Library of Congress. Dapogny’s advocacy greatly elevated Morton’s status as the preeminent composer of early jazz. A major milestone was the reconstruction of James P. Johnson’s blues operas, De Organizer and The Dreamy Kid. Dapogny discovered musical scores, long considered lost, among the collected papers of choral director Eva Jessye. The operas were reconstructed and performed in 2002 and 2006 with Dapogny at the piano. Dapogny’s teaching was recognized when he received one of the highest teaching honors at U-M, the Arthur Thurnau Professorship. He enlightened generations of music students with his passion for early jazz. Typically, his course would spend weeks critically listening to vintage New Orleans recordings, after which the sound of Louis Armstrong’s arrival would seem like the bombshell it was. A Dapogny analysis of a Charlie Parker improvised solo was as complex and revelatory as that of a Bach fugue. But Dapogny reveled equally in teaching music fundamentals to undergraduates, where he would portray a composer’s job as preventing a musical work from ending until it was time to end. Dapogny spent much of the 1980s accompanying singer-songwriter Sippie Wallace. The 1982 Atlantic album Sippie, featuring Wallace with Dapogny’s Chicago Jazz Band, was nominated for a Grammy and won the 1982 W.C. Handy Award for Best Blues Album of the Year. Jim Dapogny formed his Chicago Jazz Band in 1976; it toured in 44 states and Canada for more than thirty years and released several albums. The 2010 Chicago Jazz Festival featured the band at Millenium Park to celebrate Dapogny’s 70th birthday. From 2001 to his death, Dapogny was musical director of Phil Ogilvie’s Rhythm Kings (PORK), which appeared regularly at the Zal Gaz Grotto club in Ann Arbor. Dapogny delighted in telling his audiences about the classic jazz from the twenties the band performed. He will long be remembered for these performances that brought together everything that Dapogny excelled at as a pianist, arranger, and researcher. ABOVE: Phil Ogilvie’s Rhythm Kings at the James Dapogny Memorial March 24. Back Row:Rod McDonald, Chris Smith, Van Hunsberger. Doug Scott at the piano on left only partially visible.